I ended up in Kalamazoo tonight on a wild goose chase. As regular readers of my blog know, I live in Kalamazoo, but work in Grand Rapids. Every so often, I end up back in Kalamazoo on job related activities. Tonight was one of those nights. After finishing up my task, I wanted to find something for dinner. I was on Sprinkle Road heading back to I-94 when I realized I was coming up on a Chicken Coop. I figured I could pick up something there to eat. Regular readers of this blog will also know that my Chicken Coop experiences are mixed. I’ve had really good luck with the South Westnedge and Plainwell locations and a not-so-great experience at the Portage restaurant. 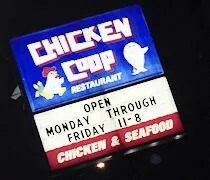 Still 100% confused on how the Chicken Coop franchise/chain thing is set up. I do know that the Kalamazoo Township location on Sprinkle Road just to the south of the BL is under the same ownership as the Portage, Watervliet, and Paw Paw locations. The thing that makes this location different from most of the others is that this is a walk-up/drive-thru location only. There is no inside dining room. Most patrons use the drive up, but I opted to walk up. There’s a little hallway type of structure where you walk up to a window. There’s a menu board on the wall as well as a door bell to get the attention of the people inside. The lady dealing with orders was taking an order from the drive up when I got there, but she turned around to acknowledge that I was there. That gave me a few more seconds to look over the menu. I knew I didn’t want a bucket, so I had a decision to make. Once she finished up the other order, the order taker walked across the small restaurant to where I was standing and slid open the window. 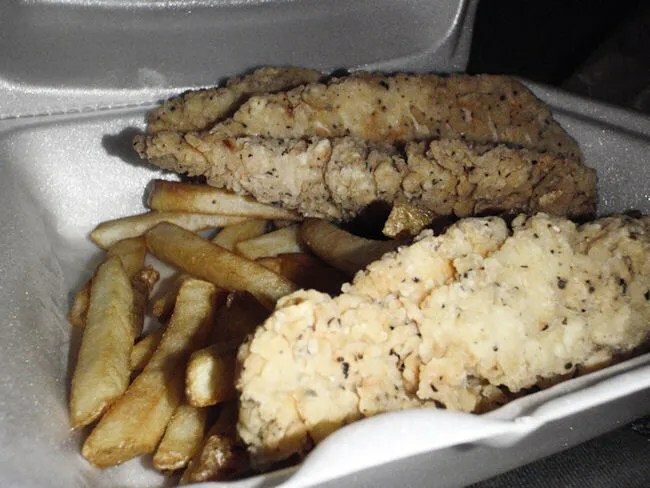 I decided on a chicken strip basket which comes with choice of side and four chicken strips. My choice of side was french fries and I paid the six dollar bill then leaned up against the wall while the cook tossed four chicken strips in to the fryer. It took a little less than ten minutes for my chicken strips and fries to be boxed up. They were a little too hot for me to bite in to right away, so I was quite a ways down the road before I was able to crack open the box and dig in. The four chicken strips were quite large and very meaty. The breading was super crunchy and had a little bit of a salty taste to it. These strips were nothing like I got at the Portage store which was good thing. They, along with the restaurant style fries, were more than enough to fill this hungry boy up. 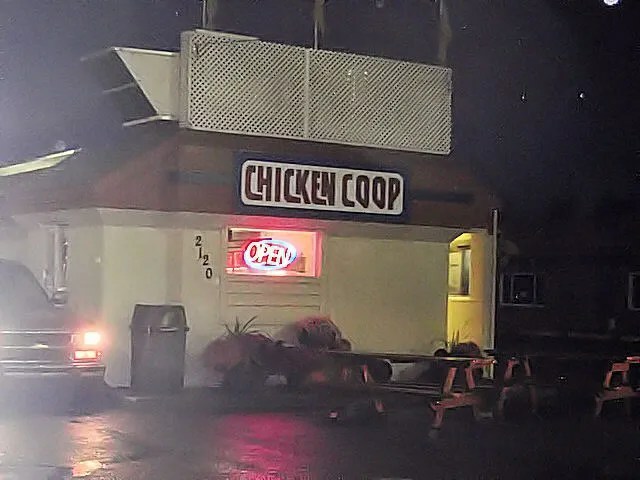 I always have such reservations when I drive by a Chicken Coop. I’ve gotten some fantastic meals from them and I’ve got some pretty bad ones. This particular stop was a pretty good one. I had chicken strips that make the fast food strips look like nuggets and it was a fairly cheap meal. This is something I would definitely consider in the future when looking for a quick, yummy meal on this side of town.